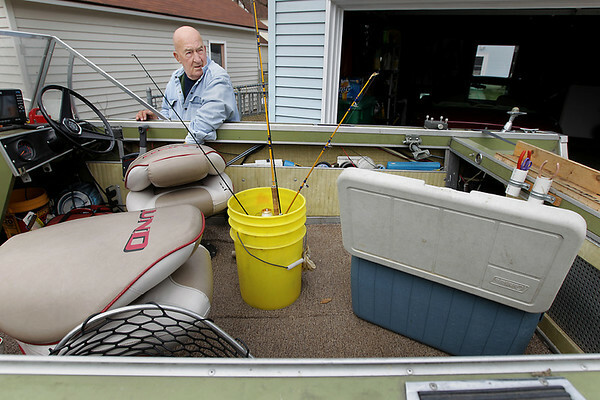 Jack Armour, of Traverse City, prepares his boat Wednesday, April 6, 2011 after it had been stored for the winter. Armour, along with his wife, returned from Orlando, FL Tuesday, April 5, 2011 where they spend the winter working for Disney. "It's the best of both worlds," Armour said about his summers spent in Traverse City and his winters spent in Florida. He plans on going fishing for lake trout and whitefish in West Grand Traverse Bay Thursday morning. "Tomorrow I'm going to wake up, eat breakfast and go fishing," Armour said. "Usually an old timer will drive by and we'll shoot the bull-lie to each other," Armour said.